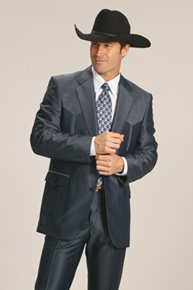 Attend Your Next Event Dressed Up In Western Style. For Special Occasions Ranging From Dinner Parties to Western Weddings, Spur Western Wear Offers A Great Selection Of Men's Western Formal Wear And Semi-Formal Wear. For A More Formal Look, Choose From A Selection Of Traditional Western Suits By Circle S. For A More Relaxed Look, Browse Sport Coats, Blazers And Frock Coats In A Variety Of Styles And Fabrics, Including Leather. Choose From Industry-Leading Manufacturers Like Circle S, Red Sky, Scully And Wah Maker.